With the appropriate bonus code, you can set yourself up with a great poker bonus. Earn free cash in a breeze. 45 days to meet the requirements. Use the points earned to cash in even more in their VIP store. When creating an account, enter the William Hill promotional code FTRVIP when signing up. The new player Welcome Package is given as a £7 cash game ticket, £3 tournament tickets, £100 flat bonus, and 10 free spins. You’ll have to earn 85 WHPoints for the £7 cash game ticket. The £100 flat bonus is released in £5 increments – 280 WHPs for the first £10, and 350 WHPs for the remaining £90. You’ll earn 14 WHPoints per dollar in rake/fees paid. Thus, to clear the entire £110 bonus, you would need to earn 6,945 WHPoints by raking £496.07. You’ll be receiving 22.17% cashback while earning this FTRVIP bonus. When signing up for a new account at Ladbrokes, make sure to enter the Promo Code FTRBONUS. This will ensure you qualify for a deposit bonus at the value of 200% up to $2,000/£1,200/€1,500. Once activated, you will have 90 days to earn the full amount at the rate of 170 points per $5 of the bonus. A total of 68,000 points are required, and you earn 10 points per $1 rake. This means you will need to generate a total of $6,800 in rake for a cashback rate of 29.41%. When you create a new Party Poker account, enter FTR500 in the Bonus Code field. All new players who deposit $10 or more will receive four $5.50 satellite tickets, for a total value of $22. In order to receive the tickets, players must accept the offer within 14 days of making their deposit. Once tickets are issues, they must be used within 7 days. Promotional codes or Bonus codes are a part of many industries and online poker is no exception. For years, Bonus codes have been an essential part of getting all kinds of Bonuses in online poker rooms. Most poker rooms offer multiple Bonuses at the same time and Bonus codes are a great way to keep track of them for individual players. Poker rooms also use Bonus codes Bonus for restricted freerolls and private tournaments. Players may be required to enter Bonus codes while registering an account or making a deposit, though the second one is preferred option by most poker rooms. Poker rooms offer all sorts of Bonuses, which include First Deposit Bonuses, No Deposit Bonuses, Reload Bonuses, etc. While most of these Bonuses require a Deposit to qualify for, some do not, like No Deposit Bonuses. 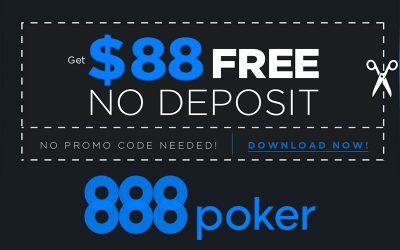 Therefore, even if a poker room uses the tradition system of entering a Bonus Code while making a Deposit, in this case, they have to use different systems. In recent years, poker rooms are moving away from the traditional bonus codes system where players have to enter them when registering their account or depositing. Now, many rooms require players to simply opt – in through their software or website to get the Bonus. The biggest advantage of this shift is that you don’t have to worry about missing out on your bonus if you accidentally forget to enter the bonus code or enter an incorrect one. Some Bonuses may be split into several parts and each may require a separate deposit. In this case, most poker rooms that utilize this system require players to enter the bonus code during each deposit. Just in case, be sure to check out the terms and conditions of the poker room where you are getting your Bonus. PokerStars offers one of the best value First Deposit Bonuses in the industry – 100% up to $600. 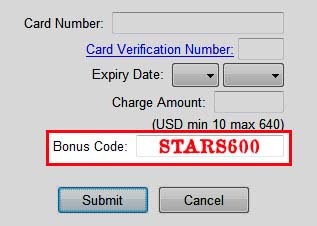 Most PokerStars Bonuses still use the classic Bonus code system where players have to enter the Bonus code when making a deposit. In case of the First Deposit Bonus, Players have to enter the Bonus Code ‘STARS600’ when making their first Deposit to qualify for the Bonus. This Bonus can also be collected in three parts with three separate Deposits and each time players have to enter the Bonus code.